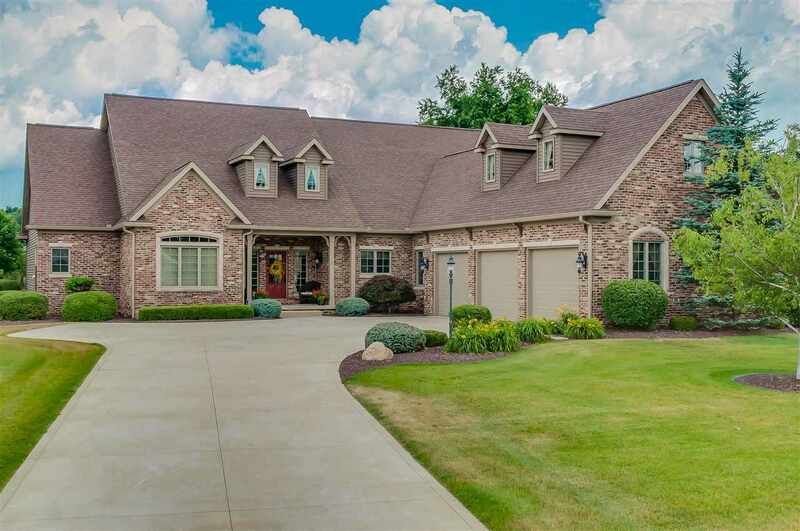 Built to perfection in 2008 by Troyer Custom Homes, this stunning one-owner home offers 4 bedrooms and 3.5 bathrooms, including lovely mother-in-law quarters with a large bedroom and bathroom, living room, and kitchen (Living Room of MIL Suite could easily be converted to 4th bedroom). With 5, 163 square feet of beautiful living space and a great open concept floor plan, the home is spacious, yet warm and inviting. The foyer opens into the Great Room which features 10-foot ceilings, Anderson casement windows, and hardwood flooring, and a gas log fireplace. Off of the Great Room is a lovely office/den with a large front window.The Kitchen includes custom, soft-close maple cabinets, granite countertops, two islands, gas range with hood, a breakfast nook, nearby half bath, and more. The Laundry Room features plenty of counter and cabinet space and utility sink. The Master Suite is truly luxurious, with his and her walk-in closets and vanities, walk-up jet tub, large tile shower, and access to the back patio. The finished lower level has 9-foot ceilings and includes a large living area with a 13-foot bar with sink, dishwasher, microwave, refrigerator, and solid cherry cabinetry. There is also a bedroom with walk-in closet, a full bathroom, and a workshop area with stairway up to the garage. The 3-car garage has sink, cabinets, and an epoxy paint floor, and the home includes 2 furnaces, 2 A/Cs, 2 water heaters, solid wood interior doors, surround sound speakers on the main/lower level. The 39&apos; x 21&apos; private patio off the back of the home features a speaker system and ceiling fan and is the perfect place to relax or entertain! Backyard also has a garden cottage with garage door, covered patio, running water, electric, and stainless steel sink - great for storage or hobbies. This home is truly gorgeous - schedule a showing today!